For years, scientists have been trying — and failing — to detect theoretical ripples in space-time called gravitational waves. But new research suggests that building just one more detector might finally do the trick. Four gravitational wave detectors are currently in operation. Proposals have been submitted to build three more, one each in Japan, Australia and India. Constructing just one of these would double the amount of sky being covered in current searches for gravitational waves and would drastically increase the chances of a detection, according to the study. The study, by physicist Bernard Schutz of the Albert Einstein Institute in Germany, waspublished May 27 in the journal Classical and Quantum Gravity. Gravitational waves, predicted by Einstein's theory of general relativity, are thought to be created by some of the most violent events in the universe, such as the collision of two neutron stars. A proposed NASA/European Space Agency mission to send a system of satellites to space to hunt for these waves was cancelled this year for lack of funding. That project was called LISA. The positioning of the current network actually makes such a large increase in detection rate unlikely, other scientists say; however, Schutz has shown that using any of the three proposed new locations would change things dramatically. The addition of all three new detectors would enable the detection of around 370 events a year, which could increase to 500 events after a few years of operation, Schutz found. 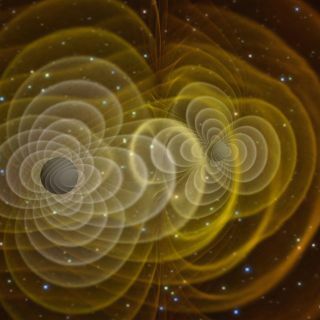 These detectors are most likely to encounter "short bursts" of gravitational waves that arise from two stars or two black holes orbiting each other. "The improvements brought about by new detectors are much bigger than the proportionate extra investment required," Schutz said in a statement. "The new detector in Japan, approved last year, would add extra sensitivity and reliability and greatly improve sky coverage. Not only would we be more certain than ever of making detections, we would begin to be able to study neutron stars and gamma ray bursts with information obtainable in no other way." Einstein's theory of general relativity describes how objects with mass bend and curve space-time. Imagine holding out a taut bedsheet and placing a football in the center. Just as the bed sheet curves around the football, space-time curves around objects with mass. And like the ripples moving across a lake, the distortion in space-time caused by accelerating objects gradually decreases in strength, so by the time they finally reach Earth, they are very hard to detect. Hard, but not impossible. "In my mind, detecting gravitational waves opens up a new way of investigating the universe," Schutz said. "We expect frequent detections of gravitational waves from merging black holes, whose waves will carry an unmistakable signature. Since gravitational waves are the only radiation emitted by black holes, we will for the first time have a direct observation of a black hole." The waves could also help researchers probe some other mysterious and powerful cosmic events. "Gravitational waves have great penetrating power, so they will allow us to see directly to the center of the systems responsible for supernova explosions, gamma-ray bursts and a wealth of other systems so far hidden from view," Schutz said. Three of the current four gravitational wave detectors exist as part of the LIGO project — two in Hanford, Washington, and one in Livingston, Louisiana — while another detector exists in Cascina, Italy, as part of the VIRGO project. Funding has begun for an additional detector located in Japan, with further proposals for developing detectors in Australia and India. It has also been proposed to move one of the Hanford detectors to Australia. A jointly owned British-German detector, located near Hanover, Germany, will begin observations for gravitational waves this summer. This facility, called GEO600, will continue to look until the LIGO and VIRGO detectors become fully operational again.